Where does Emily get the energy from for her Jumperoo?! Emily loves it and I’d highly recommend anyone to get one for their little ones. They’re not cheap if you buy it brand new, we bought ours on Tesco Direct, and even at £75, it was still cheaper than most of the many other versions of Jumperoo’s on the market at the moment. We settled for the Fisher Price Rainforest Jumperoo. Keep baby entertained for hours with the fun and colourful Rainforest Jumperoo from Fisher-Price. Kids will love to explore, discover and bounce with the many vibrant and interactive elements of this bouncer. 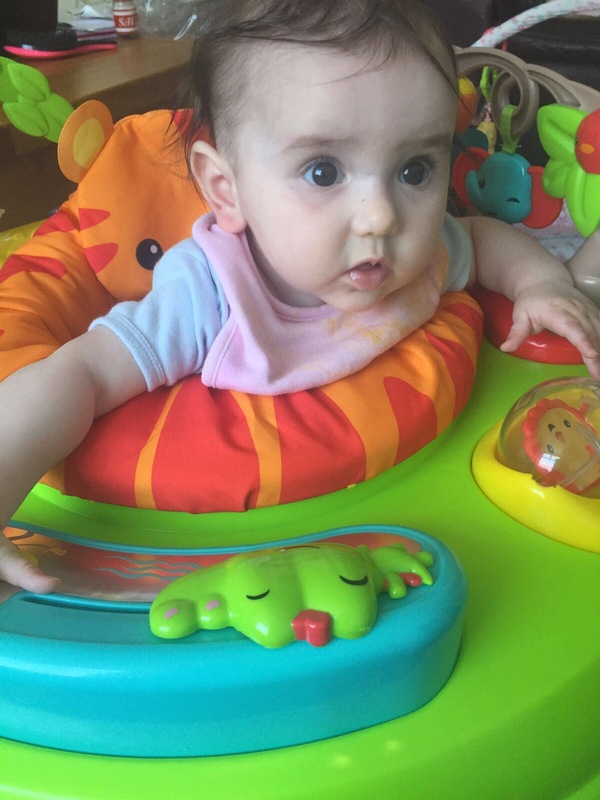 A rotating seat gives baby 360° access to toys, activities and cuddly friends, including soft monkeys overhead, spinners, clickers, a bead bar, mirror and so much more, all within their reach. Exciting music, lights, textures and sounds reward and encourage your little one at every grab, bounce and jump, supporting their growth and developing their motor skills. The Jumperoo grows with your child by easily adjusting the height of the frame, allowing them to jump and bounce as safely as possible. When not in use, the bouncer easily folds for simplified storage and portability. If you’re pondering the idea of buying one, don’t, just buy one, first-hand, secondhand, whatever. It’s great to see Emily be so interested in something besides Bing and Hey Duggee! I looooove the jumperoo, it’s brilliant!